Home / adult tutu tutorial / Boo! I didn’t attend a fireworks display on the fourth of July and have felt rather deprived ever since. So when I received an invitation to a Halloween/NaNoWriMo kick-off party tonight, I determined I wouldn’t miss any more holiday fun. Even if that meant donning a costume. But what to wear? I did a 5K race on Saturday and noticed that several of the participants were wearing tutus; this is fairly common at such events. “I have always wanted a tutu,” I sighed to my brother and sister-in-law, who ran with me. So a couple of days later, when I discovered this tutorial online, I knew exactly what I would be for Halloween. A tutu-wearing witch! I located the purple and black striped tights and black witch hat at a local Halloween store. I found a purple feather boa, too. 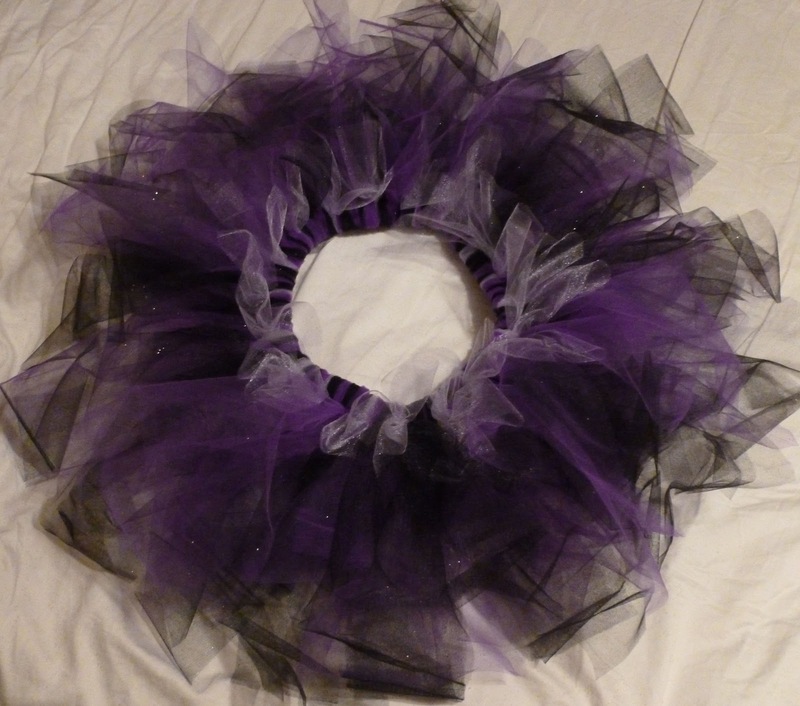 But I adapted the tutu directions as follows. Except I didn’t actually fold the strips in half and then in half again before attaching them to the elastic. I just kind of bunched them up in the middle and tied the knot. I am very pleased with the results. My first tutu! Now, here’s hoping my NaNoWriMo novel (that’s a commitment of 1667 words a day, no matter how you slice it) goes as well!